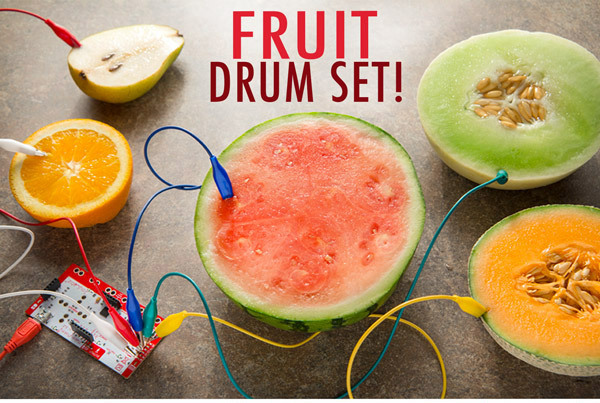 Makey Makey: Make everyday objects do amazing things. Build whimsical inventions, create interactive art, and compose electronic music with Makey Makey. 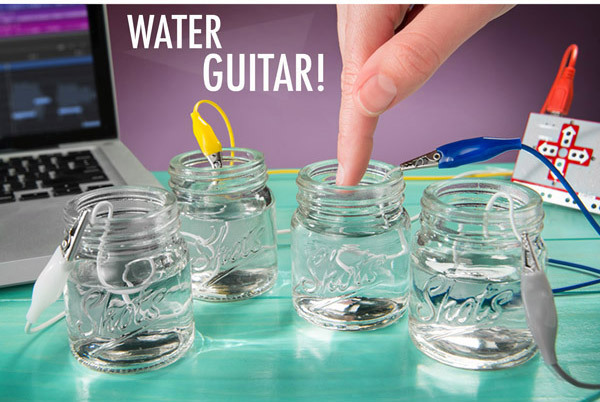 When you clip real-world things to Makey Makey, it turns the objects into keyboard keys, so you can control your computer with anything from a carrot to a bowl of water. Play Super Mario Bros. with blobs of Play-Doh, make Pac-Man eat ghosts with a controller you drew in pencil, or jam out with banana bongos. Anything that conducts even a tiny bit of electricity can become a key! 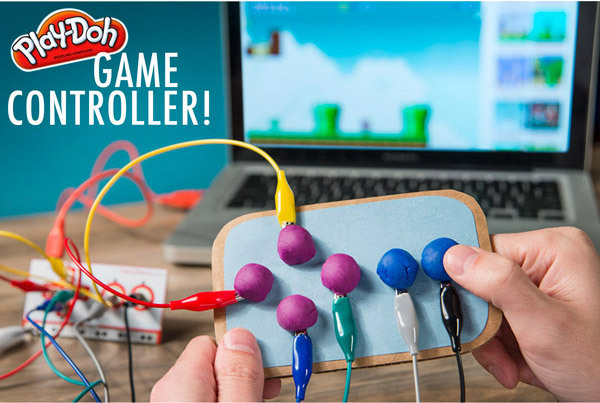 Makey Makey is truly plug-and-play, both for the computer you control and for the objects you choose for input. Here’s a short list of things you can turn into keys: skin, vegetables, pencil drawings, Play-Doh, tap water, coins, pets (if you can get them to sit still), silverware, aluminum foil, and anything else you can think of that can conduct a current. 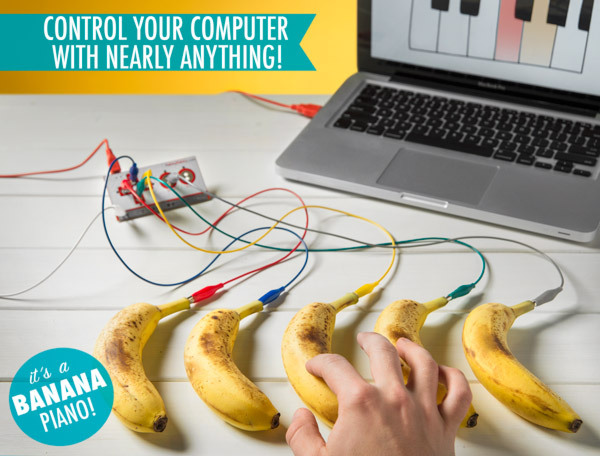 Once you’ve mastered the piano dance from the movie Big in your living room, go exploring and try creating something totally new with Makey Makey. Make any conductive object into a keyboard key. Includes controller, USB cable, 7 alligator clips, and 6 connecting wires. Works out-of-the-box on Windows and Mac OSX. Make anything into a keyboard! 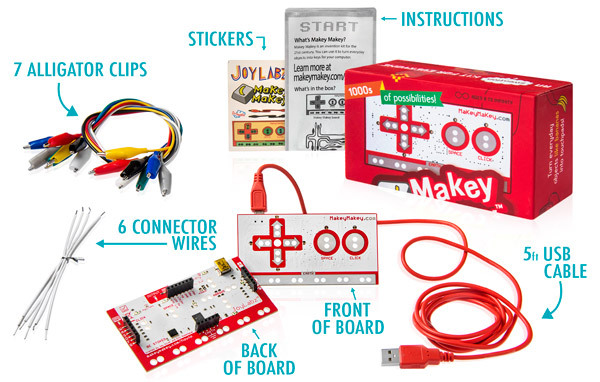 Makey Makey is a collaborative computer input that puts you in the creative seat. It’s a USB keyboard controller recognized by just about any modern OS. And you get to come up with awesome things to use as keys! Anything that can conduct even a little bit of electricity (almost all organic or metallic objects) will do. Play banana bongos, Facebook with french fries, or master Mario Bros. with mushrooms. Play “Strawberry Fields Forever” on strawberries! 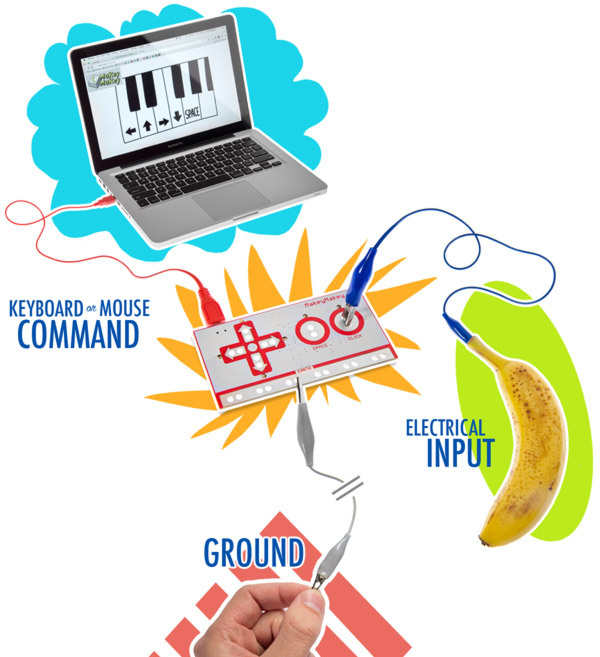 Makey Makey is a toolkit for experimentation based on the guts of a USB keyboard. But instead of connecting the circuit with plastic buttons, you get to choose your own “keys”. Use the supplied alligator clips to create an interface using the materials you have in the world around you. Almost every living thing, most metals, and even water are fair game. When you tap your eclectic inputs, the electricity is conducted through your body to complete the circuit! You don’t have to know why it works to have fun, but it’s still cool. Control your computer with anything, even the kitchen sink! Seriously, you can control your computer with just about anything. Clip on some chicken and use drumsticks as WoW hotkeys. 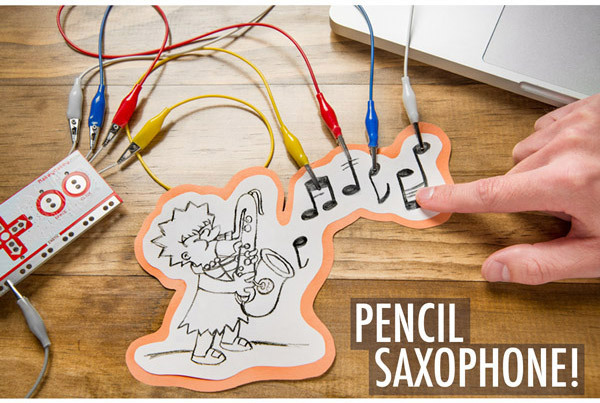 Use a graphite pencil to draw your own drum kit and jam out. Hook up some office supplies and make data entry in that spreadsheet more interesting. When it comes to what you can use, the world is your oyster. Ooh, attach some oysters and play “Under the Sea”! Warning: this device stimulates creativity. Makey Makey is an invention kit. That means it comes with everything you need to get started, but not everything you need to make it work. With the controller, a USB cable, 7 alligator clips, 6 connector wires, and dead-simple instructions, making it work could not be easier. All you need to do is hook everything up. It’s up to you to decide what you’re going to use as keys and what to do with your new invention. Not included: ingenuity or conductive keys. Question: I don’t get it. What does it do? Answer: Makey Makey bridges the gap between your imagination and a computer. It functions as a USB keyboard without the keys. Creativity comes in to play when you choose what you want your keyboard to do and what you want to use for keys. You can use any number of already-created programs that use keyboard and mouse input, or if you’re really creative, you can write your own! Question: What OS does it work with? Answer: Makey Makey is tested to work on Windows, Mac OS X, Chrome OS, and Ubuntu. Since it’s recognized by your computer as a standard USB keyboard, it probably works with plenty more operating systems that automatically recognize USB keyboards. Question: How does touching the input with your body complete the circuit? Answer: You need to separately attach your body to a ground contact on the controller. You can hold a provided alligator clip in your free hand or wear an antistatic wrist strap (not included) for two-handed operation.